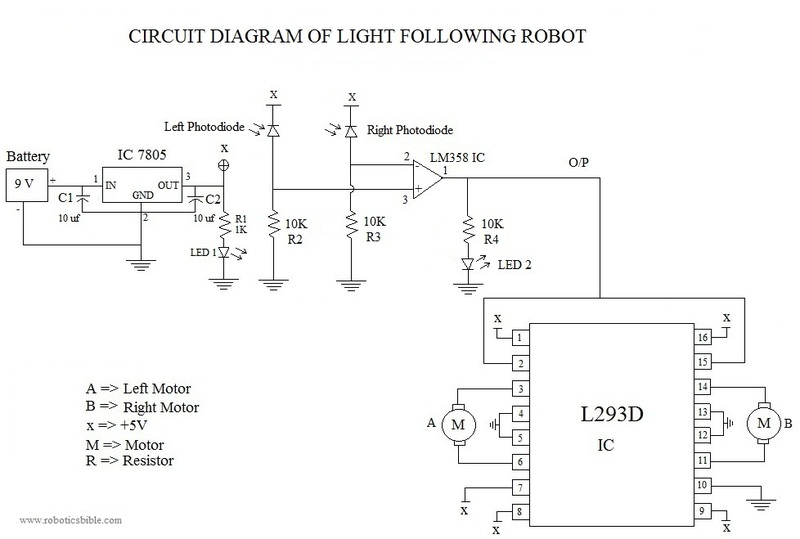 The light following robot is a mobile machine which is capable of detecting and following the light source on the traveling path. It is developed without the help of a micro-controller for providing easier connections and understanding of the circuit. 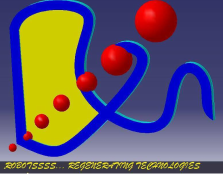 It requires fewer numbers of electronic components and very cost-effective as well. The concept of this light following robot is very simple. It includes two photo diodes, one on the right and other on the left. When the light falls on the right photo diode, the robot will move on the right side. Similarly, the robot will move on the left side when the light falls on the left photo diode. Battery: One 9V battery will be sufficient for powering the robot. For more usages, two pairs of 9V battery may be required. Battery holder: It is used to connect the battery with the circuit. Breadboard: One breadboard is used for designing the circuit. The electronic components are connected by inserting it in the holes of the breadboard. Capacitor: Two 10uf capacitors are implemented to store the current, equalize the power output, filter, and so on. Castor Wheel: One castor wheel is mounted in front of the hard board for providing easy and comfortable moving of the robot. Gear Motor: Two 300rpm gear motors are connected with the wheel for moving the robot. IC 7805: One IC 7805 voltage regulator is incorporated for allowing 5V of power supply to the circuit instead of 9V. IC L293D: One L293D IC motor driver is used for driving two motors in both clockwise and anticlockwise directions. IC LM324: One LM324 IC voltage comparator is attached to the circuit for comparing voltages across the + and – terminals. LED: A 1.5V 200mA LED is attached to notify the falling of light source on the photo diode. Resistor: One 1K & three 10K resistors are required for this process to reduce the voltage. The ranges of the resistors can be calculated with the help of a multimeter. Wheels: Two wheels (10cm dia.) are coupled with the gear motor. When the motor is powered, the wheels will start to rotate and move the robot. Wires: Two meters of both two core and four core wires will be required. For breadboard connections, two core wires should be used and for motor connections, four core wires should be used. Connect a 9V battery to the breadboard with the help of a battery holder. The positive power supply is passed to the IN of IC 7805 (1), and sent out through the OUT (3). The negative power supply is sent to the GND (2) connection of IC 7805. In between, two capacitors (C1 & C2) are connected to the IN and OUT of IC 7805 respectively. As a result of this process, 5V of current is obtained. Now, connect an IC LM324in the breadboard. As it is a voltage comparator, it will predict the output from the photo diodes based on the input voltage. For instance, let us consider that the voltage at 3rd pin is more than or equal to the voltage at 2nd pin. At this time, the 1st pin of IC LM358 will be high or else it will stay low. A 10K resistor is coupled with each photo diodes. Then, place an IC L293D in the breadboard, and join the 2nd and 15th pin of it with 1st pin of IC LM358. In between this connection, include a LED with the 10K resistor. The four – core wire of left motor is connected to the 3rd & 6th pin of IC L293D, while the right motor is attached with 11th & 14th pin. The two 10cm wheels are mounted with the motors. A castor wheel is included at the front of the robot for balanced and comfortable movements. A power supply of 5V is applied to the 1st, 7th, 8th, 9th, & 16th pins. The remaining 4th, 5th, 10th, 12th, & 13th pins are connected to the ground. After finishing all the circuit connections, place the robot in the dark room. Connect the 9V battery and power the robot. Now, show the light in front of the robot, and it will follow the light wherever it goes.